In Search of a Yosemite Brewery? If you thought a mountainous region like the Yosemite Valley would have a few great watering holes to visit after a day of hiking and exploring, you are correct! For craft brew lovers, a frothy pint of something light, stout, or something in between is a perfect reward after a fun day in one of the most beautiful and rugged parks in the U.S. Whether you’re looking for an official Yosemite brewery or just want to sample some of California’s best beers in a relaxed setting, let us point you in the right direction. Before or after you stop in a Yosemite brewery, you may want to grab something hearty to eat. Download our Vacation Guide for our guidance on dining in the area. It’s also a great resource for planning your entire visit to Groveland, Yosemite, and the surrounding area. Where Is the Best Yosemite Brewery? There are several craft breweries in the region. However, for the purposes of this blog, we’re going to focus on places you can grab a beer on the west side of Yosemite National Park close to Groveland, CA. From here, there is one establishment in particular to visit: Last Call Brewing Co. in Oakdale. It’s about an hour’s drive from Hotel Charlotte, but it’s worth it to enjoy a tasting or fill a growler to go. Last Call has a number of craft brews on tap ranging from its Covered Bridge Brown to the Stellar Galaxy and the 75-minute Pale Ale to the 108apricot. Have a seat and enjoy a sampling or two as you chat with locals, the bartender, or other travelers. Last Call Brewing Co. is open Friday-Sunday. Visit their Facebook page for their latest hours of operation. You can also enjoy a round or two of delicious appetizers such as house marinated olives and a charcuterie board. If you have really worked up an appetite, you may want something more filling like braised chicken with tomato curry chickpeas and seasonal greens or grass-fed beef patty with caramelized onion, bacon fried rice, and arugula. Fork & Love is open for dinner Wednesday through Sunday. After a day exploring the gorgeous landscape, a bite to eat and a craft beverage made at a Yosemite brewery, it’s time to sit back and relax. Hotel Charlotte is a fantastic place to do just that. Our hotel is located in Groveland, CA, right at the gateway of Yosemite National Park. 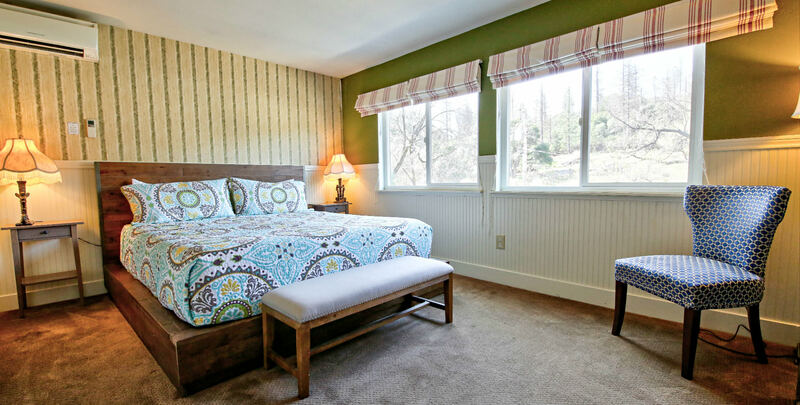 Choose from one of our 12 beautiful rooms, or if you’re traveling with a large group, you may want to rent one of our cozy vacation rentals, (like the Lavender House pictured here). Now that you’re ready to plan your dream vacation, check our availability and book your stay today!